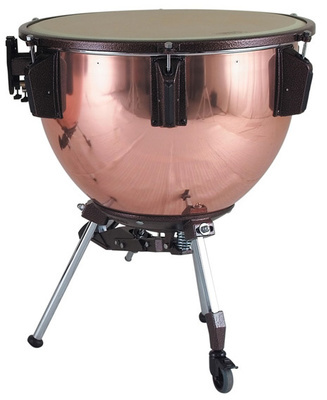 Adams 26"universal copper kettles timpani . The parabolic kettle featured in this Adams timpani line rests inside an aluminium "shell", this accounting for outstanding tonal resonance. The multi- adjustable supporting legs retract completely into the kettle for erase of transportation. To cater for extra convenience, one of three stands is fitted with a wheel.